Studio Geiger Architecture was awarded an Honorable Mention for its entry in the Building Trust International competition entitled PLAYscapes. As prompted by the competition brief, our aim was to propose a playful public landscape for a neglected, forgotten part of a city – in this case New York City. Our proposal, STAIRSCAPE, is an active extension of the city bench. 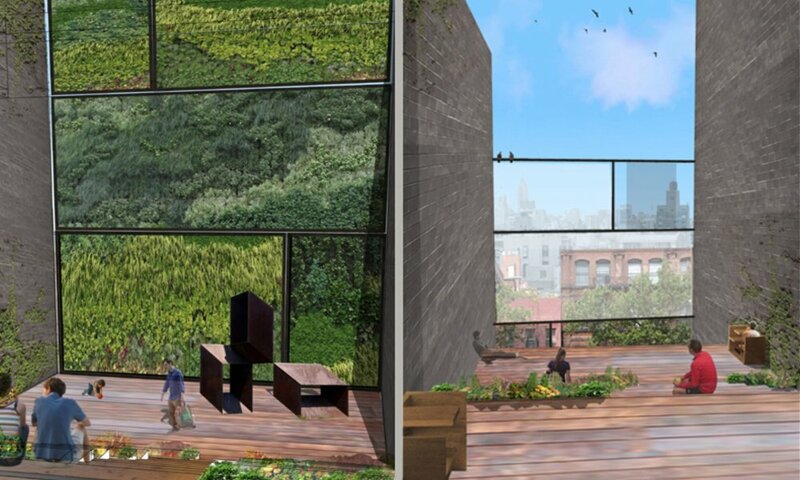 Located on a narrow vacant lot on the Bowery in the Lower East Side, the project maximizes the vertical space of the lot to create a multi-purpose, dynamic space for play, rest, motion, people watching, eating, and contemplating. Through material continuity and adaptation of the stair module, STAIRSCAPE provides a space that is accessible and engages all age groups. Stairs of two different sizes create steps for seating, as well as for movement through the tiered vertical garden space. Terraces provide areas to gather and rest, while the slide, monkey bars, and tethered balls add colorful playfulness to the vertical pocket park. STAIRSCAPE redefines the concepts of the city bench and the pocket park to make them accessible to a broader public, as well as providing a whimsical space of play and respite for the Lower East Side of Manhattan. For more information, see here.